Here we'll explain how to take care of your ceramic tile investment. So let's get started on becoming a little smarter about smart and stylish ceramic tile. Above all, it's important to sweep a ceramic tile floor regularly. Dirt can adhere to the surface of tile, particularly styles with a textured surface. Regular sweeping loosens and removes most of this dirt. Don't forget labor saving devices. 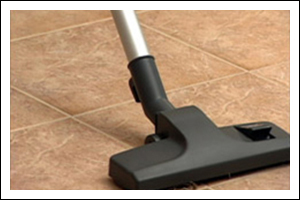 Feel free to use a vacuum cleaner, but be sure it's one without a beater bar, to avoid dulling and scratching the tiles. 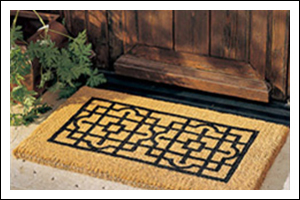 Be sure to use walk-off mats to minimize and contain dirt being tracked in at entryways. And shake them out often. 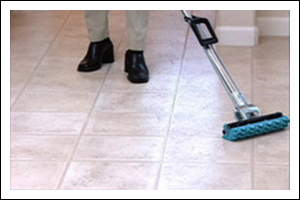 Ceramic tile floors should be damp-mopped regularly using the manufacturer's recommended grout and tile cleaners. For heavier soil, spot clean the floor with a sponge or clean cloth using the recommended cleaners. Next, rinse well and wipe dry for more shine. 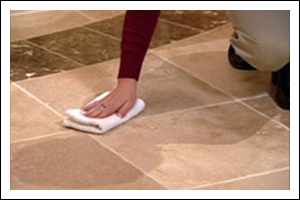 Textured tiles may require mild scrubbing with a soft brush or electric polisher or scrubber. After cleaning with a mild detergent, rinse thoroughly with clean, warm water to help remove any leftover residue. Apply to the floor, let stand for 3 - 5 minutes, lightly scrub with a sponge, rinse well. You'll want to consult the cleaning product's instructions to make sure the product is compatible with your type of tile. After cleaning, rinse well and wipe dry for optimum shine. Avoid using steel wool, scouring powders, or other abrasives. Don't use bleach or ammonia based cleaners, as these products can discolor your grout if used too often. Be fast on your feet. Try to clean up spills as quickly as possible so that the grout or tile doesn't become stained. While ceramic tile is considered very durable, it's not indestructible and may crack or chip under extreme force. Keep in mind that if a repair is necessary in the future, the replacement product may be a slightly different dye lot or texture than the original. However, with time and usage the repair will blend in. Remember that, once the tile has been laid and grouted, it's your responsibility to maintain areas exposed to water by caulking. After the installation process is complete and the grout has had ample time to cure, sealing the grout and tile can provide protection from dirt and spills. For more maintenance information specific to your ceramic tile flooring, remember to consult the ceramic tile's manufacturer recommendations. 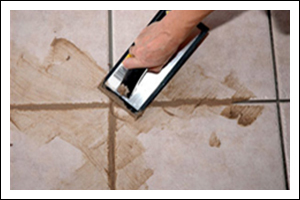 Regular care and maintenance will keep your ceramic tile looking new for years to come, and will keep your home beautiful for family and friends.